The contraceptive patch is put onto the skin and left for 3 weeks. The patch is as reliable as the contraceptive pill. Evra is the only contraceptive patch available, providing women with an alternative to the pill. The contraceptive patch protects you against unwanted pregnancy. Evra can be an easier form of birth control for women as it only requires one patch applied to the skin per week. Women are less likely to forget to take the pill with only one application per week of the patch. Evra contraceptive patch contains 2 active hormones – oestrogen and progestogen, which are released into the bloodstream when applied to the skin, prevents you from ovulating. 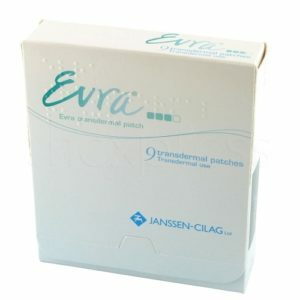 Evra patch is a thin, beige, plastic patch approximately 5cm by 5cm that sticks to the skin. It’s made up of three layers, the outer layer is water resistant and should remain in place while you shower, exercise or whilst swimming. How do I apply the contraceptive patch? Evra is applied once a week for 3 weeks followed by a 7 days break. During the 7 days you will experience your period. First you apply the patch on your upper arm, bottom, stomach or thigh area. This is done usually on the first day of you menstrual cycle. This day is usually referred to as ‘patch change day’. After seven days you remove the patch and a new patch is applied to the skin. Then the process is repeated once again when the patch day comes along. The following patch day you remove the patch and don’t replaced it for 7 days. How do I buy the contraceptive patch online? First you need to obtain a valid prescription through an online consultation to purchase the contraceptive patch. This is a free and short consultation from the privacy of your home. This replaces the face-to-face consult you would normally have with a doctor. Once you have been approved for the medication, it will be sent out to you within 24 hours. What patches are available online?